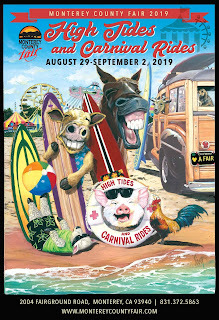 The fair also unveiled its official poster for this year’s event, featuring critters from the fair’s popular livestock displays and auctions, including a cow, horse, goat, rabbit, ewe, rooster and pig frolicking on the beach with a “woodie” station wagon and surfboards with the fair’s carnival rides in the background. Westmoreland began his career as an illustrator in the entertainment industry as an artist for major theatrical productions nationwide, including the Broadway stage. He has also worked with the Walt Disney Company and MCA Universal, later becoming a full-time staff artist at Disney. Westmoreland created numerous marketing, merchandising and collector edition pieces for Disney, as well as countless conceptual and developmental campaigns for Michael Eisner. Westmoreland’s Monterey County Fair art will be featured through the course of the 2019 Fair as the Fairs’ graphic identity. His Monterey County Fair art will be seen as the 2019 poster and shown in all of the merchandise, including T-shirts, sweatshirts and souvenirs. The Monterey County Fair will run from Thursday, Aug. 29-Monday, Sept. 2, 2019, at the Monterey County Fair & Event Center, 2004 Fairground Road, in Monterey. The Monterey County Fair & Event Center is a premier event center set on 22 oak-studded acres with ample parking. It is a state-owned multi-use facility that features four large banquet rooms, two outdoor concert venues, and a variety of outdoor and indoor cost-effective sites ideal for all types of events. It is home of the annual award-winning Monterey County Fair, host to many major and private events on the Central Coast, and the site of the Monterey Bay Race Place, a Satellite Wagering Facility. For more information, contact the Fair Administration Office, at 2004 Fairground Road in Monterey, by calling (831) 372-5863 or go to www.montereycountyfair.com for more information.